The Cumberland & Dumfriesshire Farmers Mart P.L.C. had forward 57 prime cattle, 0 young bulls, 33 over thirty month cattle, 88 prime lambs, 3,697 prime hoggs and 3,351 cast ewes & rams at their weekly sale at Longtown on Thursday 13th May, 2010. Clean cattle saw handyweights meet a similar trade with bigger cattle harder to cash. Top of 167.5p per kilo for a Limousin heifer from A. Irving, Toppin Castle to M. Wharton, Butchers, Wigton, others 166.5p, 164.5p Dashwellgreen, 163.5p, 161.5p Toppin Castle; Charolais 157.5p Hallburn, 154.5p Dashwellgreen, 153.5p Hallburn; Simmental 157.5p Hallburn. Limousin bullocks to 165.5p from A. & W.J. Taylor & Son, Dashwellgreen to W. Kirkup & Sons, Butchers, Longtown, others 163.5p The Gill, 159.5p Houghton House, 157.5p Dashwellgreen and Houghton House; Simmental 153.5p Hallburn; Charolais 147.5p Sceughdyke. Top per head of £1169.03 for a Limousin bullock from The Gill, £1140.83 Dashwellgreen; Charolais £1152.75 Sceughdyke. Heifers to £1024.08 for a Charolais from Sceughdyke. The 32 OTM cattle forward again met a fast trade for a plainer show of cattle. Top of 123.5p for a British Blue cow from W. Hodgson, Blindhillbush, 100.5p Netherhill, 96.5p Ryehill; Limousin 121.5p Nunscleugh, 111.5p Charlesfield, 109.5p Ladyhousesteads, 105.5p Hilltop (Kennedy) and Wyseby Hill Cottage; Friesian 99.5p Harelawhole, 85.5p Hethermill; Angus 97.5p Lynnshield. Limousins to £917.33 Nunscleugh, £783.75 Englishtown, £733.65 Ladyhousesteads, £730.80 Englishtown; British Blue £791.30 Ryehill, £716.25 High Floweryhirst. The 88 new season lambs saw handy weights being easy to cash. The sale levelled out at 211.1p per kilo and sold to a top of 253p per kilo for Texels from Messrs Wise, Tarnside House and to £103.50 per head for Suffolks from Messrs Roots, Kilnford Croft; Texel £96.80, £95.80 Allerby Hall; Charollais £87.80 Yett Farm; Oxford £83.80 Guards. A smaller show of 3697 hoggs resulted in a similar trade on the week for the sale to level at 190.3p/kg. Good export types were again easy to sell. 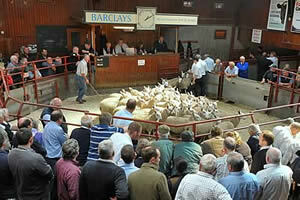 Top price per head was £109.50 for Beltex from Messrs McIlwraith, Mouldy Hills. Top price per kilo was 241p again for Beltex from Allerby Hall. Other Beltex to £109.50 Mouldy Hills, £100 Hillside; Suffolk x £97.50 Sceughdyke & Riggfoot, £94.50 Netherstenries; Cheviot £97.80 Netherstenries, £93.80 Easthouse, £92 Wicketthorn; Texel £106.50 Hillside, £102.50 Shatton Lodge, £101.50 Killinochonoch; Bleu de Maine £94.50 Newlands, £81.50 Allerby Hall; Charollais £94.50 Plumpe, £89.50 Shooters Bottom; Halfbreds £80.50 Adderston Shiels;; Greyface £95.50 Shatton Lodge, £93.80 Dunjop; Cheviot Mules £87.50 Low Oldshield, £84.20 Easthouse; Blackface £96.20 Smalmstown, £88.50 Kirkhouse, £87.20 Plumpe; North Country Cheviot £96.50 Smalmstown, £95.50 Kirkland Green, £92.50 Hillside; Swaledale £83.50 Riggfoot, £78.80 Hollinclose, £77.50 Round Meadows; Herdwicks £88.80 Hillside; Leicester £100, £83.50 Hollinclose; LLeyn £96.20, £91.20 Clonhie; Kendal Roug £74.50 Copperthorns; Shetland £78.50 Plumpe. Lightweight hoggs to £78.50 for Suffolks from Auchnagavil; Cheviots £70.20 Easthouse, £63.80 Linton, £62.50 Hawthorns; Texels £73.50 Copperthorns, £69.50 Hopestead, £64.50 Balliemore; Halfbreds £50 Alton; Greyface £67.50 Cara View, £56.50 Pine Log; Blackfaces £68.80 Cleuchhead & Alton, £59.80 Easthouse; North Country Cheviots £71.20 Mossknowe, £63 Waterside; Swaledales £60 Milescot; Beltex £74.80, £73.80 Hillside. A slightly smaller show of 3,351 cast ewes and rams was forward. Lean ewes and good fleshy types were easy to cash. Top price of the day was £166.50 for Heavy Charollais ewes from Messrs Bell, Winterhope, £128.50 Severs; Texel £131.50, £128.50 Winterhope, £126.50 Roadside; Suffolk £130.50 Winterhope, £129.50 Golden Lane, £128.50 No 6 Forss; Bleu d’Maine £129.50 Golden Lane; Leicester £126.50 Newbigging, £115.50 Stackbraes, £100.50 Langholm; North Country Cheviot £110.50, £87.50 Alton, £86.50 Rashee; Half Bred £102.50 Stackbraes; Oxford £99.50 Guards; Greyface £95.50 Golden Lane, £94.50 Sceughdyke, £89.50 Miller Hill; Wensleydale £92.50 Rashee; Beltex £88.50 Rashee, £76.50 Stackbraes; Lleyn £87.50 Newbigging; Cheviot Mule £85.50 Harwood House; Romney Marsh £83.50 Severs; Zwartbles £68.50 Vallance Rigg. Hill ewes to £74.50 for Cheviots from Cardewlees, £70.50 Golden Lane and Killean; Blackface £72.50 Ballaglass and Stackbraes; Swaledale £64.50 Newington, Broom House, Round Meadows; Kendal Rough £59.50 Kirkland Green; Jacob £59.50 Ifferdale, £58.50 Golden Lane; Herdwick £51.50 Cardewlees. Rams to £146.50 for Texels from Rashee, £144.50 Severs, £138.50 Tercrosset; Suffolk £140.50 Golden Lane, £132.50 Kirkhouse; Charollais £138.50 Rashee, £104.50 Severs; Dorset £128.50 Rashee; Rouge £126.50 Severs; Beltex £118.50 Rashee; Leicester £118.50 Kirkhouse, £100.50 Shankfieldhead; Border Leicester £118.50 Roadside; Berrichon £116.50 Miller Hill; North Country Cheviot £102.50, £98.50 Hownam Grange; Bleu d’Maine £94.50 Newbiggin; Blackface £72.50 Kirkhouse, £70.50 Carrick Point.